Long time no blog! Sorry for the ridiculously long delay again. I know, I know, bad blogger. Things have been more than a little crazy in my personal life, and I have been a lot of trouble with my asthma so there hasn't been much running going on to blog about. However, I do have a review of an absolutely fabulous product that is long overdue. A while ago I was approached by Alexia from Tough Girl Tutus and asked to review one of their tutus. Pretty much if you've ready anything on my blog you know how much I love running in tutus so I jumped at the chance to try one out. Tough Girl Tutus are tutus that are designed specifically for runners. They have no liner so that you can wear your favorite gear underneath and special toggles built in for your race bib. They also come in cute colors/designs. They don't move well - Despite how cute they are while posing for pics, they tend to bunch up between my legs while running which is definitely not cute. I had high hopes for the tutu because Alexia was so wonderful to work with and the tutu passed my expectations by far. Before the race I snapped some pictures. Let me preface these pics by saying that I was NOT in a posing mood. At last years Warrior Dash everyone was in costume, but this year almost no one was and I felt really awkward, especially because one of my guy friends (now bf!) was there and my sister and I had forced him into a costume too. As you can see the tutu was really cute. The toggles held the bib in place securely and it was nice and full. After a few pics my sister and I decided to move the bib to my shirt, only because I was worried with all the mud and jumping it may be harder to see my bib number if it were down low and I wanted my fire leaping pics again! haha. I think it would've been fine on my tutu looking back, but oh well. Here's a few more pre-race pics once I moved the bib. My sister, Kevin, and Me all ready to go. We made poor Kevin wear that ridiculous outfit all day! As for the race, The tutu held up beautifully. It never felt tattered or worn and it moved like I had hoped. No scrunching and bunching up every 5 minutes. It was soooo much more comfortable than any other tutu I have worn. And even soaking wet and muddy It stil looked cute! My costume held up really well and I'm so glad I was wearing a Tough Girl Tutu! Kevin's homemade costume that my sister and I put together did not fair so well. haha. I forgot to mention the tutu even lasted through the wash and will live to see another race! 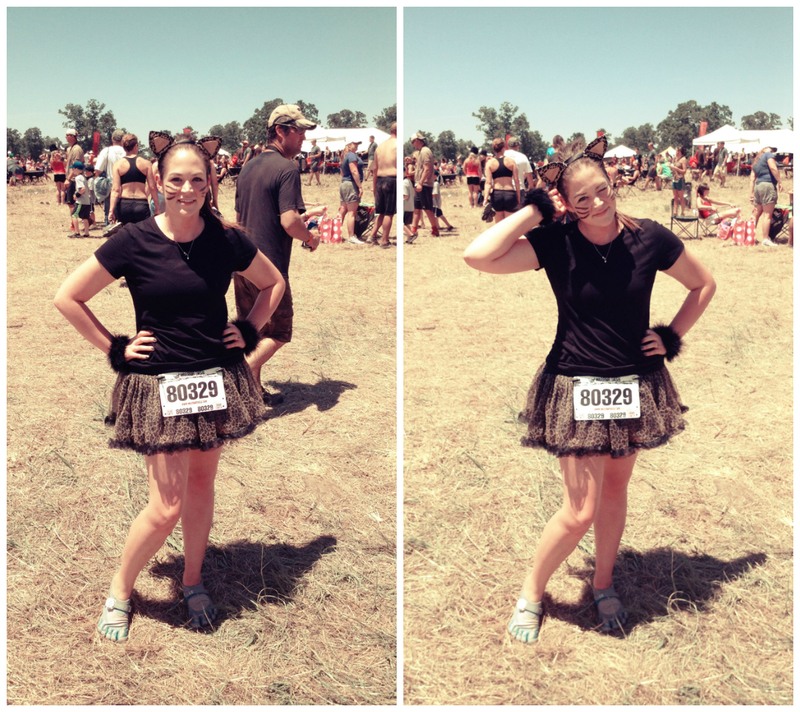 If you guys are thinking about getting a tutu for a race, the Tough Girl Tutus are worth every penny! Please go check them out! NOTE: This review was made possible by Tough Girl Tutus. I was not compensated for this review other than a product sample provided by Tough Girl Tutus. All opinions are 100% mine.